Concept albums are always a double-edged sword. While we love to remember the truly successful ones (Operation: Mindcrime comes to mind) and the so-called rock operas, there have been already tons of albums that have drowned in oblivion. 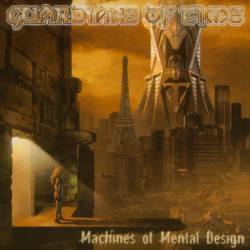 I wouldn't be surprised if the same happened to Machines Of Mental Design, the second album by Norwegian Guardians Of Time. From certain points of view, they really worked well on this science fiction story about time travelling: band name, exquisite cover painting, songs divided into chapters, it all looks like a regular sci-fi story. But once you start listening to the music, the whole concept disappears. Starting with a boring intro that's supposed to get you into a futuristic cyber-punk atmosphere, the album continues with twelve more or less ok melodic power metal songs. While the first of four chapters may catch your attention, the remaining songs all sound too much the same. While technically without a fault, there is just too little variation in the song writing, and the high pitched vocals might also scare more than enough people away. If you're into fast guitar solo stuff, then you'll get a lot of these here, and those among you who crave lots of double bass attacks also won't be disappointed. What really irks me though is the fact that if you didn't know this was a concept album, you would never guess it. The songs just follow one another, without making atmospheric links. Machines Of Mental Design is not really a bad album if you can live with these kind of vocals, but don't expect too superior song writing. If you strive to get the biggest collection of melodic power metal, then you might as well buy this album, although I urge you to download some music samples from the band's well designed website.